I took this image during Elise and Dan's outdoor ceremony at Kortright Centre for conservation in Woodbridge Ontario. One of the most important parts of the wedding ceremony is the exchange of vows. It is at this time when the bride and groom promise to love, support and protect each other for as long as they shall live. The exchange of the vows is one of those moments when the bride and groom express their feelings of love freely. It is also a very intense episode of the big day is its tradition states that the couple should recite the words from memory. Often, people are afraid of speaking in public. Combine that with the stress of the wedding day and get a clear picture of what's going on. 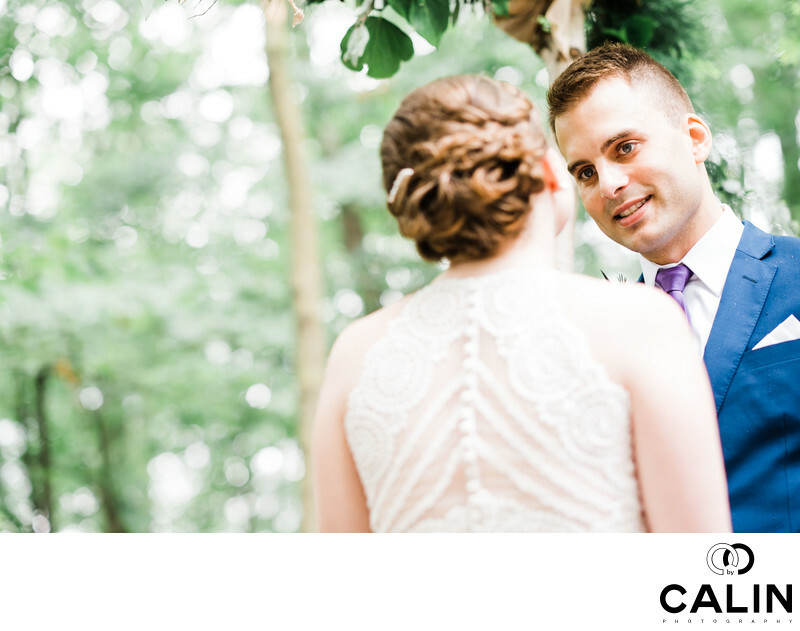 During the fall exchange I captures some of the most beautiful photographs in my wedding photography career in the special event at Kortright Centre didn't disappoint. Several times the couple burst into tears and I was lucky enough to capture those beautiful moments. In this photograph, captured over the bride shoulder, the groom is looking lovingly at her while reciting his vows. Increased tension in the frame I placed my subject to the right side of the image and tilted the camera to give the shot dynamism.